We are becoming a nation of people who take our music wherever we go. It occurred to me recently that our headphones and Bluetooth speakers have replaced transistor radios and boomboxes. I first became aware of portable Bluetooth speakers a few years ago when we had semi-regular access to a neighbor's swimming pool. The small speaker was perfect for streaming music from my phone while we swam. In the last few years, Bluetooth speakers have improved in sound and battery life. I've been listening to two Bluetooth speakers, with differing designs and features. Both have the ability to work wirelessly up to 33 feet from your phone or connect to any sound source with a headphone jack. 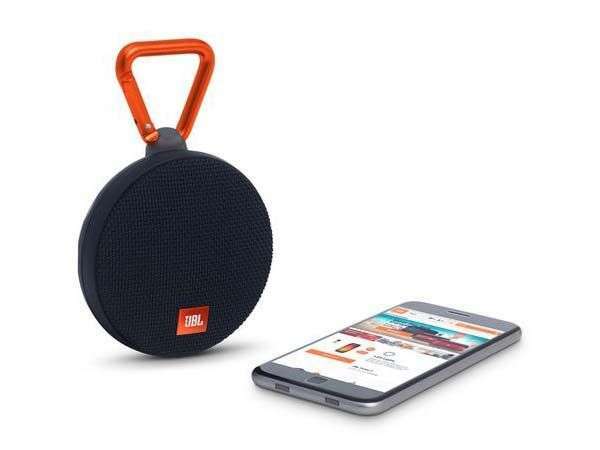 The JBL Clip 2 ($49.95 at jbl.com) is a small, hockey-puck-size speaker with a small carabiner with which you can hang it from a belt loop or backpack. The Clip 2 features up to eight hours of music playback from its built-in 730 milliamp-hour battery, which charges in 2.5 hours from a microUSB port. Frequency response is 120Hz-20kHz (-6dB) from a single 40 mm driver outputting 3 watts of power. The Clip 2 is IPX7 water-resistant, which means it can be submerged in up to 3 feet of water for up to 30 minutes. It's perfect to hang in the shower or take to the pool. Voices sounded quite clear on my James Taylor Holiday Pandora station. One nice feature is the ability to wirelessly daisy-chain two Clip 2 speakers for simultaneous playback. The Clip 2 has a microphone and will act as a good speakerphone for your connected cellphone. You can also connect to any music source with a 3.5 mm input. The Clip 2 has a foot-long aux cable that wraps around the circumference of the speaker quite conveniently. I was impressed with the sound quality and volume of the Clip 2. The sound was warm, clear and open. Aukey isn't exactly a household name. In fact, it doesn't have a website. You can read about and order its products from Amazon. 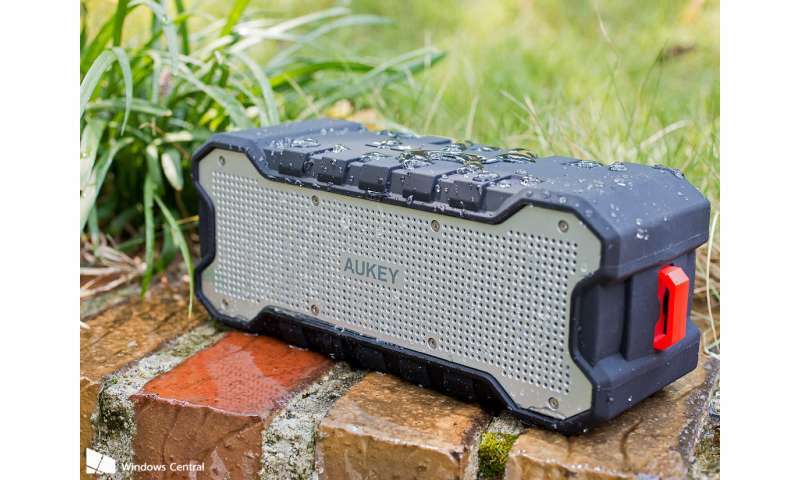 The Aukey SoundTank Bluetooth Speaker ($39.99 at Amazon.com) is built to take some abuse while it plays your tunes. The SoundTank is a rugged rectangle enclosure with two 5-watt speaker drivers that can keep the music going for up to 30 hours from a built-in 2,600 mAh rechargeable battery. The SoundTank, like most Bluetooth speakers, can also let you wirelessly make and take phone calls. The SoundTank has a standard tripod mount so you can attach it to something sturdy. It measures 4.72 inches by 9.84 inches by 3.54 inches and weighs 1.9 pounds. I was just about ready to write off the SoundTank as having puny sound quality, but then I discovered a button on top labeled with an M.
The tiny instruction manual says it's a Menu key, but when I pressed it, the music magically enhanced the sound and boosted the bass. The sound was transformed, and my ears were happy. My advice is to quickly press the M button when you use the SoundTank. Strangely, the manual makes no mention of what happens when you press the Menu button. I couldn't find any official specifications about water resistance, but the black rubber skin and rubber covering the ports mean this speaker can take a splash. I'd keep it out of the pool, though. Either of these speakers will do the job. The Clip 2 is smaller and more refined, while the SoundTank is bigger, has more speakers inside and can take some abuse. Cons: Instructions could be better.